Ad rotation is the changing of ads that are displayed using a list of ads. Ad rotation may be performed for all visitors or for repeat visitors. 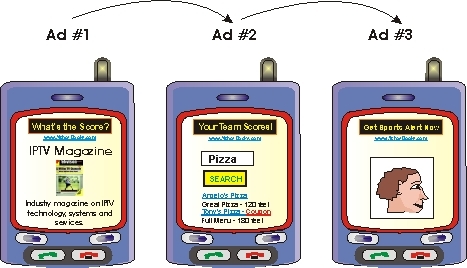 This figure shows how ads can be rotated to the same user. This example shows that the ads that can be presented to the same recipient in a specific order. The first ad introduces the recipient to concept of a new news service. The second ad highlights a benefit of the news service. The third ad provides information on where the user can obtain a subscription to the news service.